It's eight-thirty in the morning. I'm sitting in a hotel suite in Las Vegas. My colleague Dan Cooper is sitting next to me in near silence. Both of us are in the same room, with the same silence, but we're feeling very different things. I have an intense, yet not uncomfortable "tight" sensation on my right temple. Dan is looking very lethargic. I'm riding the ridge between uneasy and buzzing. Two neuroscientists are also in the room. Dan and I are holding phones, with an app. His subdued state, and my alertness aren't a result of too much/too little coffee. We're self-administering these sensations through the app. 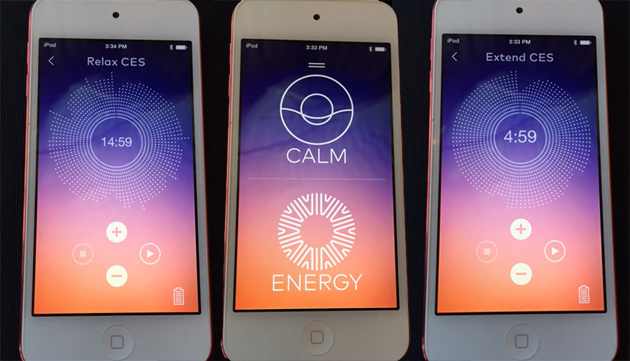 This is Thync, a wearable device that uses neurosignaling to shift your mood. It's working. Before we got hooked up like lab rats, our meeting with Thync was much like any other product briefing. We were told how the company has received $13 million in funding, about how the team of neuroscientists with over 75 years of experience had a vision of making a consumer product that could alleviate the stresses and strains of modern life. We're told about the company, Thync, and how it wants to deliver a product that can help people alter their mood at will. We're also told that its initial research found that mood-changing science, and the scams around the same topic form an almost "total overlap." Thync has currently been trialed on over 3,000 people, and the maker's claim response has been positive. The product works by delivering waveforms to the brain via electrical pulses. It does this with a small device that you stick to your temple (and another part lower down the neck). Unlike conventional devices that Thync's creators claim barely differ from the sponge-and-saltwater contacts used 50 years ago, Thync sticks to the skin (comfortably) with specially designed pads. I push the team to explain the science behind their product, but I'm met with hushed caution. The best I get is an explanation that "by delivering neurosignaling waveforms to the brain along known neural pathways, you have an ability to tune the balance of brain activity between relaxation and arousal or attention circuits." The team is also cagey about us showing the device. This is common when products are in early design stages. No problem, but Thync is extra cautious -- not wanting us to share what the device actually looks like. It's a shame, because I think it would get people more curious. All I can tell you is that the most developed prototype is smaller than a hand, and is worn on the head. The app component looks very slick, and has a simple interface. You choose your desired mood (relaxed or motivated), dial in the intensity, make sure you're all hooked up and let it fly. Thync hopes that when the product launches later this year (no word on price) you'll use the product in a similar way to how we use coffee, or chamomile tea now. One to pick you up, the other to settle you down -- just with fewer hot fluids involved. When you're starting out, Thync recommended doing so in quiet, comfortable surroundings (the hotel suite is barely quiet, but definitely comfortable). However, once you've got the hang of things, you can use it on the go. Even during exercise. There is, of course, a caveat: It works for about 80 percent of people. Some users will have no response. Sorry, guys. All I know for sure is that I enjoyed my experience. I liked it, and want to try it again. I don't know if this was placebo, a willingness for it to work or something else. I'm definitely not a morning person, and I left the briefing in a very different state to when I went in. I only wish the team were more explicit about the science, the stuff that's going on inside, and allowed us to reveal more about the product. Especially given the natural suspicion that many consumers have about "mood enhancing" devices, and even more so when they're propped up by incomplete insight into what's going on. Now that the energized feeling has faded, I'm left a little frustrated. Something only Thync can solve.